With 2016 sales and revenues of $38.5 service ? red by heavy fuel oil, and on billion, Caterpillar is the world’s lead- the other end of the power continuum, ing manufacturer of construction and the all-new C7.1 commercial propul- mining equipment, diesel and natural sion engine will soon be launched in gas engines, industrial gas turbines and 280, 350, 400, and 425HP con? gura- diesel-electric locomotives. The compa- tions. This new platform will be an ideal ny principally operates through its three stablemate to the new C9.3 propulsion product segments - Construction Indus- engine (375, 416, 476 bhp) that has al- tries, Resource Industries and Energy ready proven successful in towboat and & Transportation - and also provides ? - ? shing boat applications. Additionally, Caterpillar offers a com- engines. Cross Sound Ferries recently latter two featuring Cat Propulsion azi- Island Shipyard, also featuring 3516Es. JA Moody is the national distributor Problems with the metal valves in the used in both hot and cold water applica- for Emerson valves and control prod- pools and spas would cause extended tions, heating and ventilation systems, ucts. With millions of passengers trav- delays in dry dock for service and re- swimming pools and waste water treat- eling each year, cruising has become a pairs. JA Moody was able to offer Em- ment, such as puri? cation, ozone and major part of the tourism industry. For erson’s Composeal valves with multiple demineralization. In addition to their companies like Norwegian Cruise Line, available con? gurations to readily ser- enhanced performance, Composeal but- it is critical that their passenger ships vice Norwegian Cruise Line’s applica- ter? 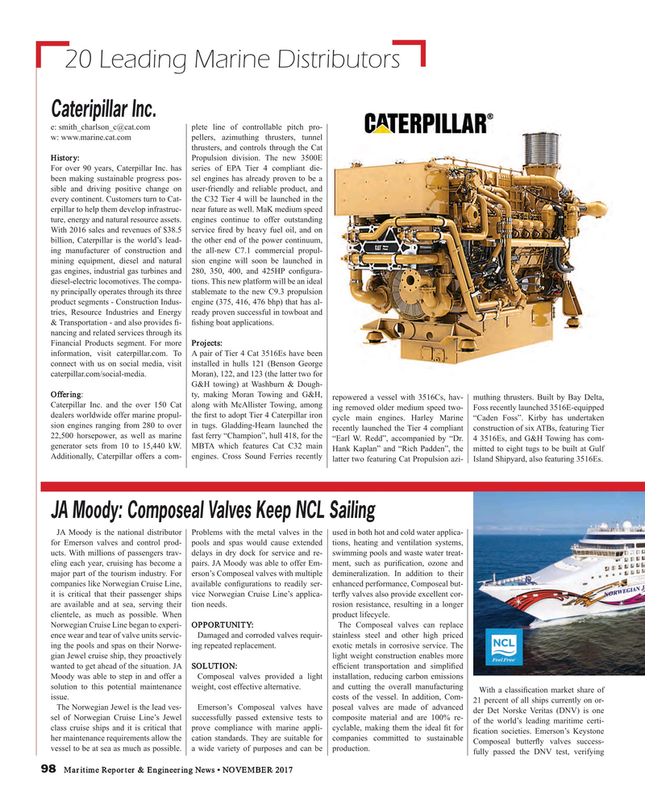 y valves also provide excellent cor- are available and at sea, serving their tion needs. rosion resistance, resulting in a longer clientele, as much as possible. When product lifecycle. Composeal butter? y valves success- vessel to be at sea as much as possible. a wide variety of purposes and can be production.